Today Zsofia created a lovely floral card featuring the fun floral die cuts from our Flower Trio Die Set. She cut out three flowers using the stitched edge flower with shades of purple and pink. Then she added white centers to the flowers using the smaller flower die cut. She added a pretty silver gem onto each flower center. She also cut out two leaf clusters using the die set. For her card she made a panel of matching colors using Alcohol Pearls and added the flowers in a corner cluster over this panel. So pretty! 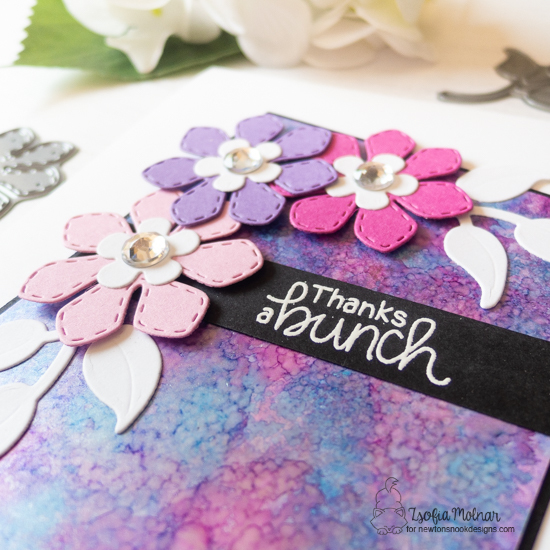 She also added the sentiment "thanks a bunch" from our Floral Fringe Stamp Set, embossed in white on a strip of black cardstock. Here is a close-up so you can see all the shimmer and sparkle! Thank you, Zsofia, for the beautiful inspiration today! You can find more of Zsofia's lovely creations and say hello to her over at her blog, Safsafdesign.